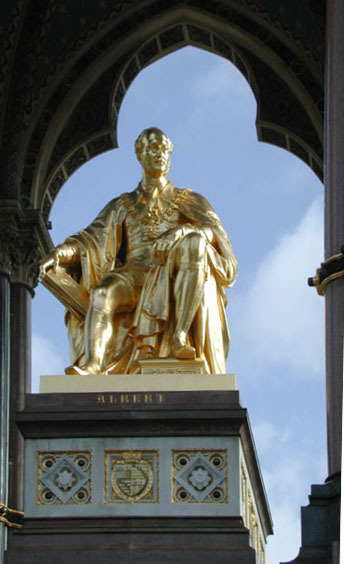 The science journalist Alan Weisman has calculated that our bronze statuary will endure in recognisable form long after our lofty towers have toppled and our motorways crumbled to dust. Because they are made of chemically inert metals, the theory goes, these statues may well be mankind’s most enduring legacy – such that an extraterrestrial archaeologist some 5 million years hence may gaze with bug eyes on Glynn Williams’s memorial to Lloyd George and wonder what strange form of life could have produced such an artefact. 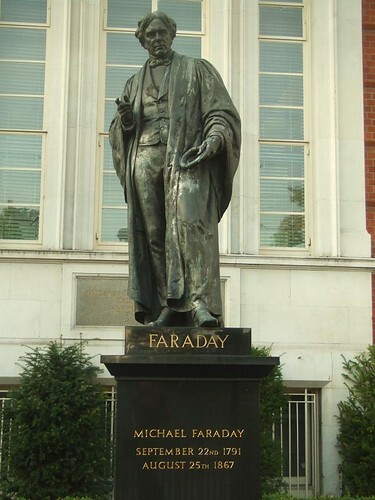 Which is as good a reason as any that we should strive to have public sculpture of the very highest calibre. On such a geological timescale, the monuments of London (erected, for the most part, over the past 200 years) are separated from Roman bronzes by a mere blink of an eye, and it is telling to observe how frequently latter-day artists lean on Classical precedent to gain a touch of gravitas. A virtuoso representation of the folds and draperies of fabric is a recurrent theme, although few go so far as to put their subjects into a toga: Palmerston holds a coat over his arm, in emulation of the dress of Roman senators; Prince Albert is arrayed in the gilded robes of a Knight of the Garter; Pitt the Younger dons a cloak, Faraday sports an academic’s gown, and Carlyle sits out in all weathers wearing his dressing gown. 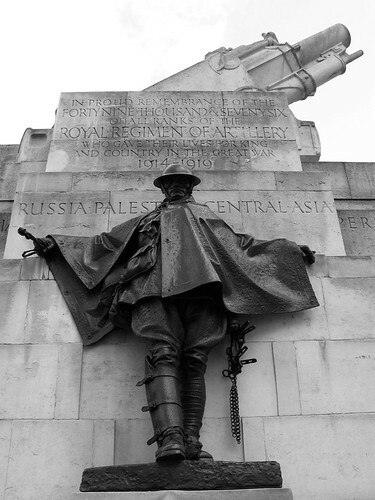 Perhaps the most moving update of the drapery tradition is visible on Charles Sargeant Jagger’s sombre Royal Artillery Memorial at Hyde Park Corner, where a gunner’s sodden rain cape deftly evokes the horrors of trench warfare. 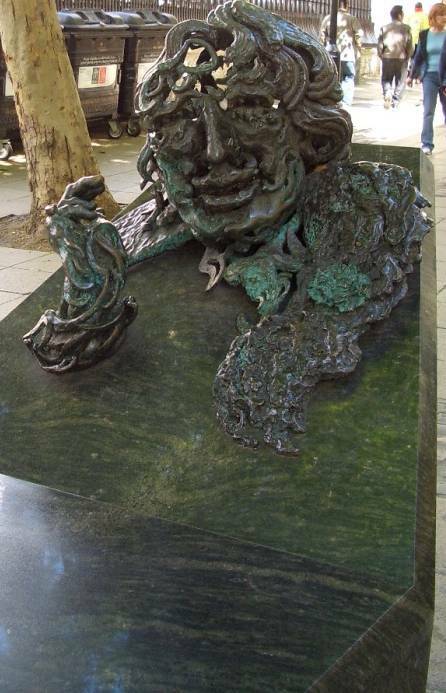 At the other end of the scale, Maggi Hambling’s bizarre monument to Oscar Wilde, resembling some polyp from Quatermass rather than the great epigrammatist, illustrates the peril of deviating too far from the Classical tradition: the focus of a memorial should be the subject, not the sculptor. Dennis Gilbert’s excellent photography captures these often-overlooked landmarks in sharp detail, accompanied by potted biographies for the benefit of readers who might care to know that Nelson suffered from seasickness or who seek to understand the profound irony of Eduardo Paolozzi’s statue of Newton being based on an engraving by William Blake. The book ends with a suggestion of 100 more figures whose lives deserve commemoration in bronze, stone or even aluminium (as with Eros in Piccadilly Circus), ranging from Francis Drake to Douglas Adams. 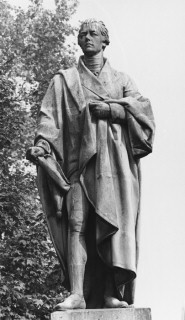 Indeed, that list could be expanded to include John Ruskin, Walter Pater or Sir Kenneth Clark, just to dispel the mean-spirited notion that no-one ever erected a statue to a critic. First published in World of Interiors issue 324. Reproduced with permission.